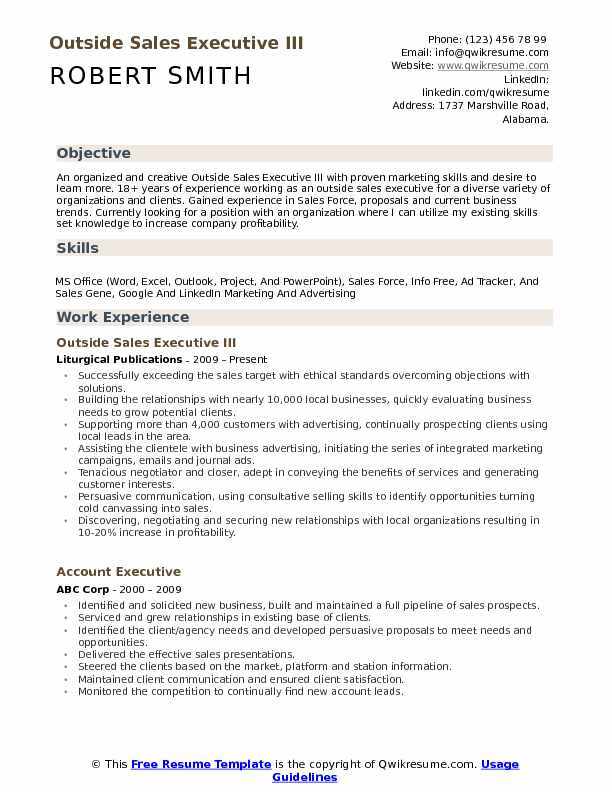 Outside Sales Executive promotes and sells products and services of the company by shouldering various roles and responsibilities such as – generating leads by identifying potential clients, communicating with clients, explaining and engaging the prospects, identifying product improvement, preparing reports, maintaining healthy relationship with clients, negotiating terms and conditions with clients and closing sales successfully. 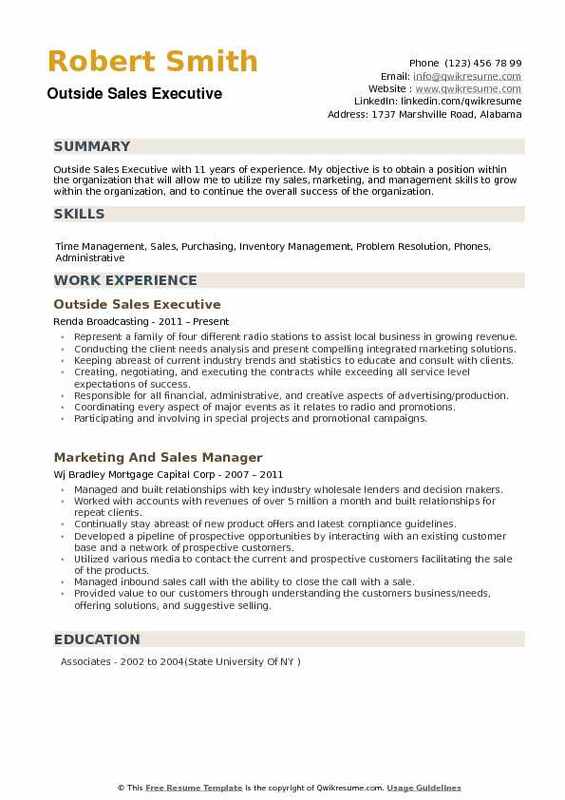 The best Outside Sales Executive resume emphasizes proven selling experience, presentation skills, self-motivation, stamina, negotiation skills, and ability to meet sales goals, prospecting skills, sales planning abilities, creativity, computer competencies and an outstanding motivation for sales. Candidates applying for this role come from varying background and hold at least a degree in the related field. But, employers often consider a high school diploma with several years of experience in the sales platform. 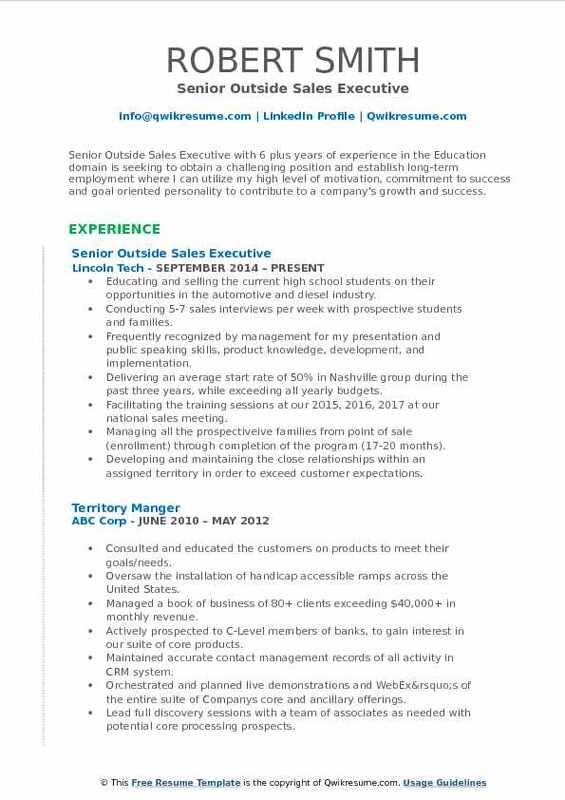 Summary : An organized and creative Outside Sales Executive III with proven marketing skills and desire to learn more. 18+ years of experience working as an outside sales executive for a diverse variety of organizations and clients. Gained experience in Sales Force, proposals and current business trends. Currently looking for a position with an organization where I can utilize my existing skills set knowledge to increase company profitability. Successfully exceeding the sales target with ethical standards overcoming objections with solutions. Building the relationships with nearly 10,000 local businesses, quickly evaluating business needs to grow potential clients. Supporting more than 4,000 customers with advertising, continually prospecting clients using local leads in the area. Assisting the clientele with business advertising, initiating the series of integrated marketing campaigns, emails and journal ads. Tenacious negotiator and closer, adept in conveying the benefits of services and generating customer interests. Persuasive communication, using consultative selling skills to identify opportunities turning cold canvassing into sales. Discovering, negotiating and securing new relationships with local organizations resulting in 10-20% increase in profitability. Negotiating and securing a new relationship with clients, resulting in 80% in new sales growth increasing new client base. 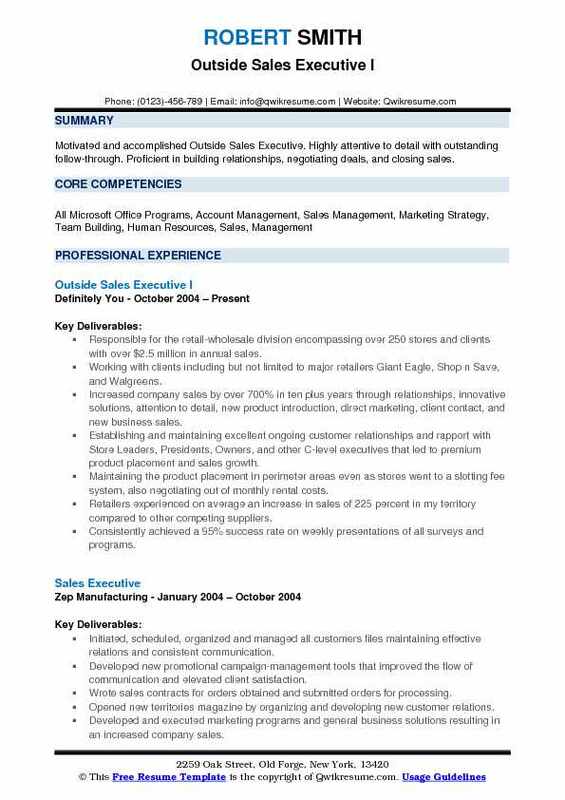 Summary : Motivated and accomplished Outside Sales Executive. Highly attentive to detail with outstanding follow-through. Proficient in building relationships, negotiating deals, and closing sales. Responsible for the retail-wholesale division encompassing over 250 stores and clients with over $2.5 million in annual sales. Working with clients including but not limited to major retailers: Giant Eagle, Shop n Save, and Walgreens. Increased company sales by over 700% in ten plus years through relationships, innovative solutions, attention to detail, new product introduction, direct marketing, client contact, and new business sales. Establishing and maintaining excellent ongoing customer relationships and rapport with Store Leaders, Presidents, Owners, and other C-level executives that led to premium product placement and sales growth. Maintaining the product placement in perimeter areas even as stores went to a slotting fee system, also negotiating out of monthly rental costs. Retailers experienced on average an increase in sales of 225 percent in my territory compared to other competing suppliers. Consistently achieved a 95% success rate on weekly presentations of all surveys and programs. Recognized numerous times for outstanding sales performance by company President as sales have increased every year in my territory, even as trends in our business are difficult to predict due to championships and other hot market items. Objective : A seasoned self- confident Junior Outside Sales Executive with 3 plus years of experience in the Fleet Management industry with a special talent for affirming client relationships and opening new accounts. Generating new, high-quality sales demos to be completed by Account Executives. Meeting all key performance metrics and goals on a weekly and monthly basis. Researching and targeting the exciting new companies. Using all available sales data to recognize trends and drive outreach decisions. Creating the successful cold calling and email campaigns targeting new prospects. Learning and demonstrating the Company's platform to prospective customers. Managing the free trial implementations and work with sales engineers to troubleshoot issues. Gaining the proficiency in SalesForce.com data logging. Periodically traveling to territory events to meet existing prospects, providing face to face product demos, and generating new pipeline. Working with a close-knit team of talented sales experts. 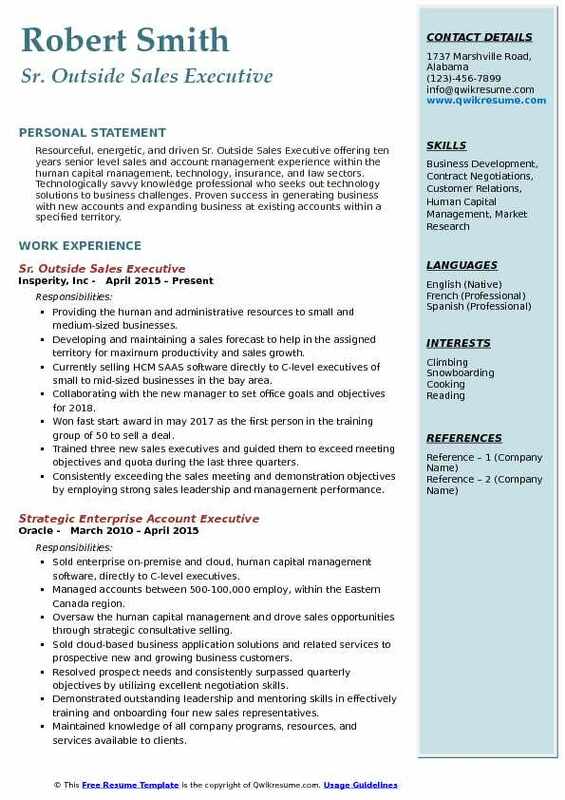 Headline : Senior Outside Sales Executive with 6 plus years of experience in the Education domain is seeking to obtain a challenging position and establish long-term employment where I can utilize my high level of motivation, commitment to success and goal oriented personality to contribute to a company's growth and success. Educating and selling the current high school students on their opportunities in the automotive and diesel industry. Conducting 5-7 sales interviews per week with prospective students and families. Frequently recognized by management for my presentation and public speaking skills, product knowledge, development, and implementation. Delivering an average start rate of 50% in Nashville group during the past three years, while exceeding all yearly budgets. Facilitating the training sessions at our 2015, 2016, 2017 at our national sales meeting. Managing all the prospectiveive families from point of sale (enrollment) through completion of the program (17-20 months). Developing and maintaining the close relationships within an assigned territory in order to exceed customer expectations. Conducting 40 new sales presentations, and 20 service meeting with decision makers of prospective clients/portfolio. Summary : Resourceful, energetic, and driven Sr. Outside Sales Executive offering ten years senior level sales and account management experience within the human capital management, technology, insurance, and law sectors. Technologically savvy knowledge professional who seeks out technology solutions to business challenges. Proven success in generating business with new accounts and expanding business at existing accounts within a specified territory. Providing the human and administrative resources to small and medium-sized businesses. Developing and maintaining a sales forecast to help in the assigned territory for maximum productivity and sales growth. Currently selling HCM SAAS software directly to C-level executives of small to mid-sized businesses in the bay area. Collaborating with the new manager to set office goals and objectives for 2018. Won fast start award in may 2017 as the first person in the training group of 50 to sell a deal. Trained three new sales executives and guided them to exceed meeting objectives and quota during the last three quarters. Consistently exceeding the sales meeting and demonstration objectives by employing strong sales leadership and management performance. Working with clients and internal staff to resolve client problems and complaints immediately to the appropriate individual or team. 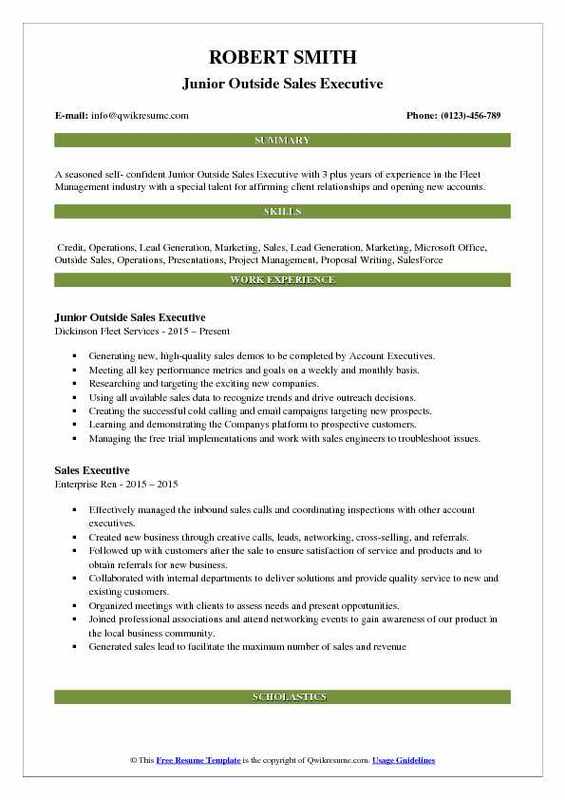 Communicating professionally and cooperating with the Sales Manager and Support Staff. 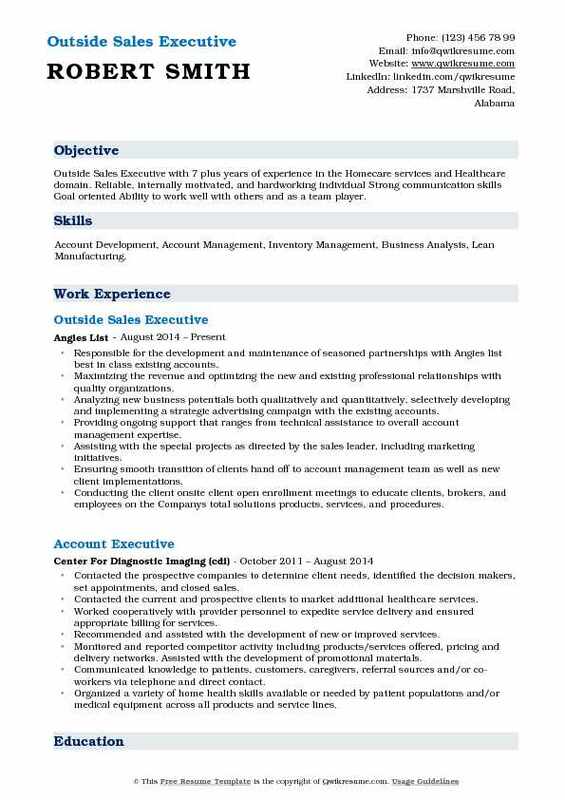 Summary : Outside Sales Executive with 7 plus years of experience in the Homecare services and Healthcare domain. Reliable, internally motivated, and hardworking individual Strong communication skills Goal oriented Ability to work well with others and as a team player. Skills : Account Development, Account Management, Inventory Management, Business Analysis, Lean Manufacturing. Responsible for the development and maintenance of seasoned partnerships with Angie's list best in class existing accounts. Maximizing the revenue and optimizing the new and existing professional relationships with quality organizations. Analyzing new business potentials both qualitatively and quantitatively, selectively developing and implementing a strategic advertising campaign with the existing accounts. Providing ongoing support that ranges from technical assistance to overall account management expertise. Assisting with the special projects as directed by the sales leader, including marketing initiatives. Ensuring smooth transition of client's hand off to account management team as well as new client implementations. Conducting the client onsite client open enrollment meetings to educate clients, brokers, and employees on the Company's total solutions products, services, and procedures. Determining the client goals and objectives, and deciding which solutions are appropriate. Summary : Experienced and goal oriented Outside Sales Executive with 11 years of experience, with expertise in account and project management. Skilled in the proactive lead generation through networking, cold calling, and personal marketing. Focus on cultivating strong client relationships through successful program implementations. Scheduling an average of 7 appointments per week and conducting the live demonstrations with executive-level decision makers across multiple industries. Creating and presenting the business cases, ROI/Cost analysis, and economic solutions. Completing the program implementation through effective project management and onsite client training. Attending the local conventions and trade shows to promote and market company's solution set. Scouting new prospects to add value to CRM database through cold calling, foot canvassing, and online tools. Successful at building relationships with all major decision makers including, CEO’s, Presidents, Business Owners, VP of Sales, Purchasing Managers, Buyers, Category or Product managers and creative teams in agencies or in-house. Responsible for managing customers needs, developing and growing business as well as prospecting for new customers and opportunities. Successfully grew existing customer business and expanded into a wide range of new markets. Summary : Established Outside Sales Executive with 15 years of experience in the Finance domain is seeking to extend my sales knowledge and ability in a challenging and growth-oriented company, focused and persistent, my experience includes turning sales, prospecting new customers and building profitable long-term client relationships. 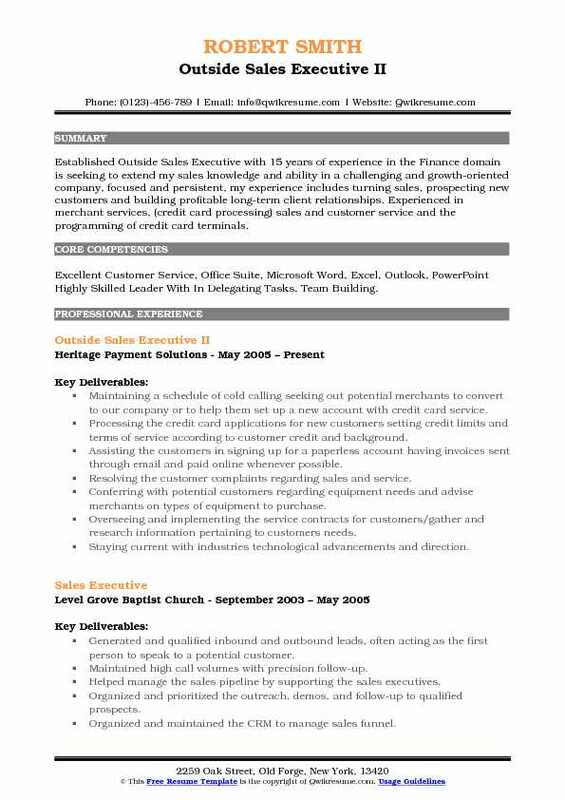 Experienced in merchant services, (credit card processing) sales and customer service and the programming of credit card terminals. Skills : Excellent Customer Service, Office Suite, Microsoft Word, Excel, Outlook, PowerPoint Highly Skilled Leader With In Delegating Tasks, Team Building. Maintaining a schedule of cold calling seeking out potential merchants to convert to our company or to help them set up a new account with credit card service. Processing the credit card applications for new customers setting credit limits and terms of service according to customer credit and background. Assisting the customers in signing up for a paperless account having invoices sent through email and paid online whenever possible. Resolving the customer complaints regarding sales and service. Conferring with potential customers regarding equipment needs and advise merchants on types of equipment to purchase. Overseeing and implementing the service contracts for customers/gather and research information pertaining to customers needs. Staying current with industries technological advancements and direction. Targeting specific companies and or industries as directed in order to raise territory revenue. Training the customers on the operations and functions of the merchandise purchased. Upselling the customers on value added services and products. Summary : Experienced sales executive with proven skills in sales both in person and over the telephone. Over 15 years of experience in Business to Business sales. Personable, motivated, enthusiastic, and competitive, with strong negotiating and networking skills. Excellent closing skills and superb multitasking skills. Key in developing sales forecasts, product pricing, and launching new products into the marketplace. Proven ability to manage key account relationships and large-scale projects. Performing B2B cold calls to generate new business and open up new accounts. Implementing the customer intimacy days to optimize relationship building and generate new areas of sale within the account. Grew and managed the book of business from $0 to $1.5 million in 3 years of employment. Generating the monthly average sales of $140,000 including an average of $25,000-$35,000 being direct gross profit revenue dollars per month. Opened and grew key local, regional and national accounts growing them to over $100,000 annually. Directing all projects from initial consultation through design, printing, production, and delivery. Building pipeline of customer leads through cold calling, appointment setting, and customer referrals. Working with area sales manager on salesforce implementation to the sales team. Attending the training seminars to improve knowledge in both sales and industry. 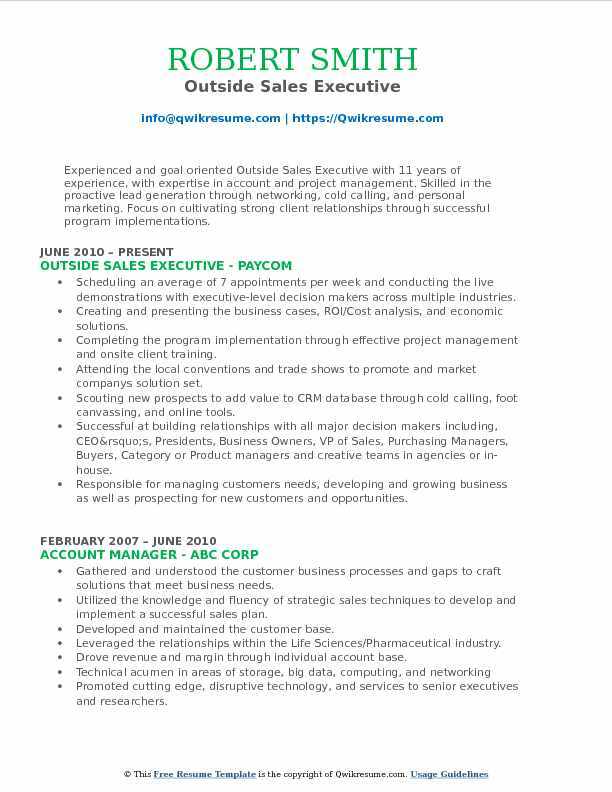 Summary : Outside Sales Executive with 11 years of experience. 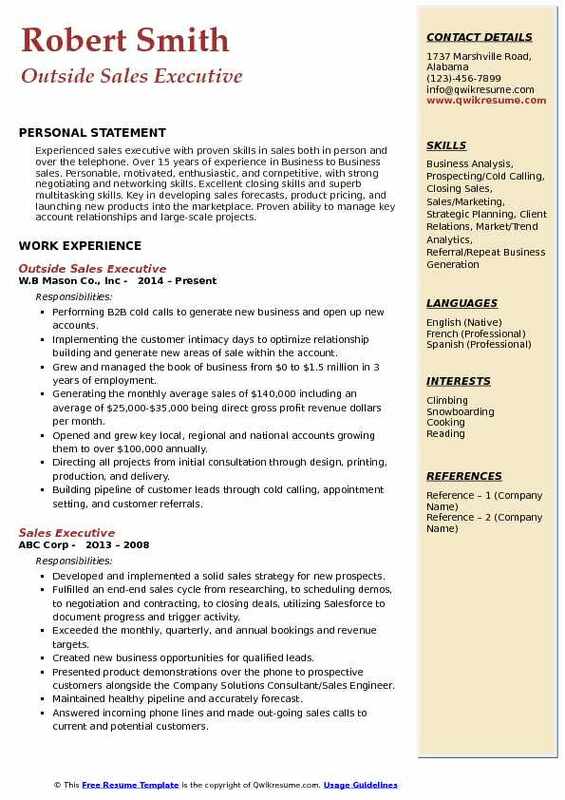 My objective is to obtain a position within the organization that will allow me to utilize my sales, marketing, and management skills to grow within the organization, and to continue the overall success of the organization. Represent a family of four different radio stations to assist local business in growing revenue. Conducting the client needs analysis and present compelling integrated marketing solutions. Keeping abreast of current industry trends and statistics to educate and consult with clients. Creating, negotiating, and executing the contracts while exceeding all service level expectations of success. Responsible for all financial, administrative, and creative aspects of advertising/production. Coordinating every aspect of major events as it relates to radio and promotions. Participating and involving in special projects and promotional campaigns. Working with the account managers for retention and account development 98% retention. Providing customers with marketing tools and programs to help drive sales. Successfully buildiing and sustaining the strong relationships with clients leading to increased collaborative sales for our team.